The E10A-USB is supplied with the capability to install one Device Group, an additional purchase of one or more Device Group Addition(s) enables the same E10A-USB to support devices from other Device Groups. Please view the Installation and Device Group Additions pages for further details. E10A-USB emulator is connected to the user system via the exclusive debug interface Note1 (H-UDI Note2 and AUD Note3). That enables to debug in such an environment that is about equal to the actual. Using personal computer (IBM PC compatible) with USB 1.1/2.0 (Full-Speed) as a host computer, E10A-USB emulator can debug not only in laboratory but also fields and anywhere. 1: E10A-USB emulator is not support all the microcomputers which has the exclusive debug interface (H-UDI and AUD).Please refer to the Target devices list. 2: The H-UDI (User Debugging Interface) is an interface compatible with the Joint Test Action Group (JTAG) specifications. 3: The AUD (Advanced User Debugger) is one of the emulator functions. The AUD has Branch trace function and RAM monitoring function. As the emulator function depends on the emulator, please refer to the emulator manual to see if the emulator has the AUD function or not. Debugging windows launch for each device. Synchronize the execution control between the multi-core devices. Simultaneous break and execution start of the multi-core devices are selectable. Sequential break between the multi-core devices is selectable. The trace of the multi-core devices are available simultaneously. Trace of a specific core is available. Common watch is used for the time stamp. Each core counts the number of events and cycles. 1. The connector to user system is not included. 2. The software may not be the latest version because of the shipping time. Please upgrade your software to the more recent version here. 3. The CD that comes with the E10A-USB emulator does not include a compiler package. 4. Optional user interface cable for 38-pin Mictor connector is available. In case of corruption and loss, you can purchase user interface cables individually. Optional cable to connect the E10A-USB emulator (HS0005KCU01H, HS0005KCU02H) to the 14-pin connector. Optional cable to connect the E10A-USB emulator (HS0005KCU02H) to the 36-pin connector. Please note that the optional cables that come with the HS0005KCU04H and HS0005KCU14H are not available for purchase as separate items. 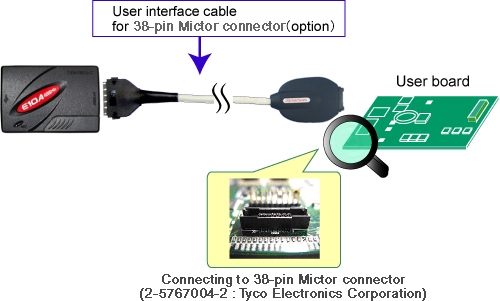 User interface cable for 38-pin Mictor connector is an optional cable to connect the E10A-USB emulator (HS0005KCU02H) to the 38-pin Mictor connector （2-5767004-2 ： Tyco Electronics Corporation) mounted on the user system. Note: The 38-pin Mictor connector is also used when connecting the E200F emulator for SH7780 Series (R0E0200F2EMU00) to the user system.